VIRGINIA BEACH, Va. — Soldiers and Airmen assigned to the Virginia National Guard’s Fort Pickett-based 34th Civil Support Team were evaluated as fully trained on 12 essential collective tasks after conducting a Training Proficiency Evaluation Oct. 26, 2016, at Camp Pendleton in Virginia Beach, Virginia. The mission of the 34th CST is to support civil authorities in a domestic chemical, biological, radiological, nuclear or high-yield explosive incident, and the evaluated tasks included deploying the team, establishing communications and medical support, conducting survey, technical decontamination and analytical functions as well as conducting interagency coordination. The evaluation was supervised by U.S. Army North’s Civil Support Readiness Group-East in order to validate the unit’s level of readiness. TPEs occur approximately every 18 months for each of the nation’s 57 CSTs. The 34th CST is comprised of 22 full-time Army and Air National Guard personnel with the mission to support civil authorities at a domestic CBRNE incident site with identification and assessment of hazards, advice to civil authorities, and facilitating the arrival of follow-on military forces during emergencies and incidents of weapons of mass destruction terrorism. The unit complements and enhances, but does not duplicate, state CBRNE response capabilities is divided into six sections: command, operations, communications, administration/logistics, medical/analytical and survey. The team is equipped with a variety of the latest military and commercial CBRN equipment and maintains on-call team members prepared to deploy an advance team within 90 minutes of notification, with the rest of the team following within three hours. CST members can scientifically identify nearly all chemical, biological and radiological substances, assess current and projected consequences of those hazardous substances, advise the incident commander on response measures and assist with requests for additional support. 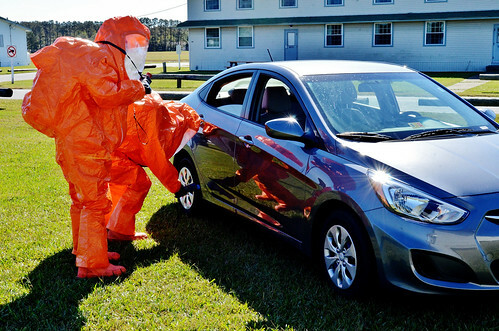 Wheeler explained that the scenario for evaluation focused on the team’s reaction to simulated chemical, biological and radiological hazards in an urban environment at a notional crime scene located in the Hampton Roads area. In the exercise scenario, the 34th CST responded to a request from the local Virginia Beach Fire and Police departments regarding a fire alarm that was triggered on Camp Pendleton. The responding security patrol apprehended two suspects, wanted by the FBI, fleeing the area in a vehicle. While in route to a detention facility, one of the detained personnel began to show signs of nausea, chills and then vomited in the vehicle, indicating the possibility of contact with some type of hazardous material. A sweep of the building conducted by the VA Beach Fire and Police departments identified a laboratory set up and other items which indicated the making of some type of toxin to be released within a public setting. The team’s initial surveillance sweep also discovered a radiation source being emitted from suspects’ vehicle. The members of the CST conducted multiple surveys to evaluate the scene and collected notional hazardous material samples for analysis. Once the analysis was complete, they were then able to provide insights and advice to the incident commander to help with the overall response to the situation. Maintaining proficiency is an ongoing task for the CST. CST members have to complete more than 1,800 hours of training to be certified, Wheeler said. During each training year, they conduct hundreds of hours of additional training and conduct multiple exercises all over the commonwealth. The 34th CST’s primary area of responsibility includes a 300-mile radius from its home station at Fort Pickett and stretches as far north as Pennsylvania and as far south as South Carolina.